Greg and his wife Joan have been ministering at Calvary for over twenty years. Prior to their coming, Greg was a youth and education pastor in Huntsville, Alabama. 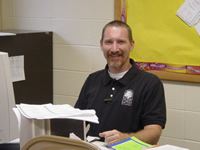 He is an adjunct professor at Grace College and Seminary teaching courses in Bible, theology and Greek exegesis. Initially graduating from Indiana University with a B.A. degree, he went on to graduate from Grace Seminary with an M. Div., and Columbia Evangelical Seminary with a research Doctorate in Theology. For fun he enjoys reviewing theology textbooks for Zondervan Publishers for use in the classroom, Evangelical Theological Society meetings, running (generally when the weather is nice), flying (now out of the business world ONLY when the weather is nice), rebuilding motorcycles, Greek Grammar, and those many Bible studies and discussions with people here at Calvary Baptist Church. Greg has had the privilege of teaching in several countries in Africa and Europe, and even got to preach once or twice through an interpreter on one of Calvary Baptist’s mission trips to Brazil. The Lord had Greg and Joan serving in the world of private and corporate investment finance for fifteen years all over the eastern United States when finally, after much prayer, He allowed them to settle in full time here at Calvary. Joan was attending Grace College when she met Greg who was at the Seminary at the time. They were married, and now have three wonderful daughters who love the Lord. Erin is married to Aaron Wright and they reside in Minneapolis, MN, where Aaron is employed by Chik Fil A. Emily and Sarah are students at Purdue University in Lafayette, IN.